Mid Sussex police were out in force on Thursday (March 28), promoting road safety – as part of a crackdown on antisocial driving in the district. Officers from Mid Sussex Police Prevention Team conducted numerous road safety stops in and around Burgess Hill, Haywards Heath and East Grinstead. Of the drivers who were stopped in the high visibility operation, a number were reported for speeding offences. 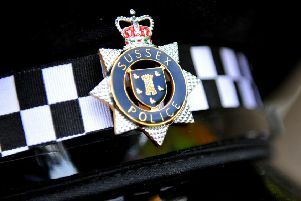 Sergeant Allan Philip, for Mid-Sussex and Crawley Prevention, told the Middy: “On Thursday, March 28, Mid Sussex Police prevention team conducted numerous road safety stops in and around Burgess Hill, Haywards Heath and East Grinstead. “Of the drivers who were stopped in this high visibility operation, a number were reported for speeding offences. “Some of those stopped were found to be well in excess of the speed limit within 30 and 40 miles per hour areas respectfully. “Mid Sussex Police Prevention Team will continue to highlight the dangers of driver behaviour. “There is currently a Europe-wide campaign being co-ordinated by TISPOL which specifically aims to deal with dangerous and irresponsible drivers for offences, including speeding. “This runs until next Monday, April 8. Members of the public who have witnessed irresponsible and antisocial driving are cncouraged to report it to Operation Crackdown online at www.operationcrackdown.org. Officers used speed devices in various locations on Thursday, to detect drivers who were speeding and ‘causing a danger to other road users and pedestrians’ Sgt Phillip said. As well as reporting drivers for the offence of speeding and any other offences that came to light, other checks were carried out to ensure vehicles were roadworthing and legal, added Sgt Phillip. These included MOT, road tax and driving licence checks, which were completed on all drivers stopped. Operation Crackdown is a joint initiative run by Sussex Police and the Sussex Safer Roads Partnership. It allows people to report any kind of antisocial driving such as speeding.